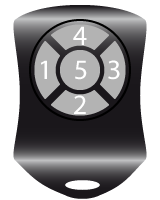 A remote / key fob can be used at multiple locations. You would need to follow the below configure instructions for each econx device. Now confirm all buttons are working. Press all buttons on the remote/key fob again and ensure that the corresponding button on the image changes to green. Remember it may take 5-10 seconds to register each button. Under 'Attached Key Fobs' select the user you wish to configure, then complete Steps 10-13 above.